Green: Zone is scheduled to run at some time in the future. Gray: This zone is not scheduled to run in the future. Blue (dark): Zone is current active. 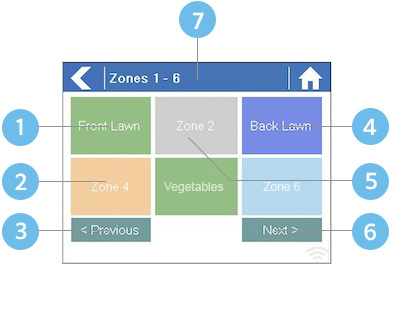 Blue (light): Zone is waiting for another zone to finish watering and then will start immediately. Gold: This zone is a master zone.